"By adopting this system we are now seen as professional and progressive within our town"
Interested in joining our team? Want to partner with us? We’ve put this guide together to help compare options and choose the right solution to help you manage your business. Tick features off as you go. Print or share the buyer's guide with your line manager or business owner to see all our feautres. Comparing Fergus against other providers? Use our Buyer's Guide to easily check and compare against other solutions. 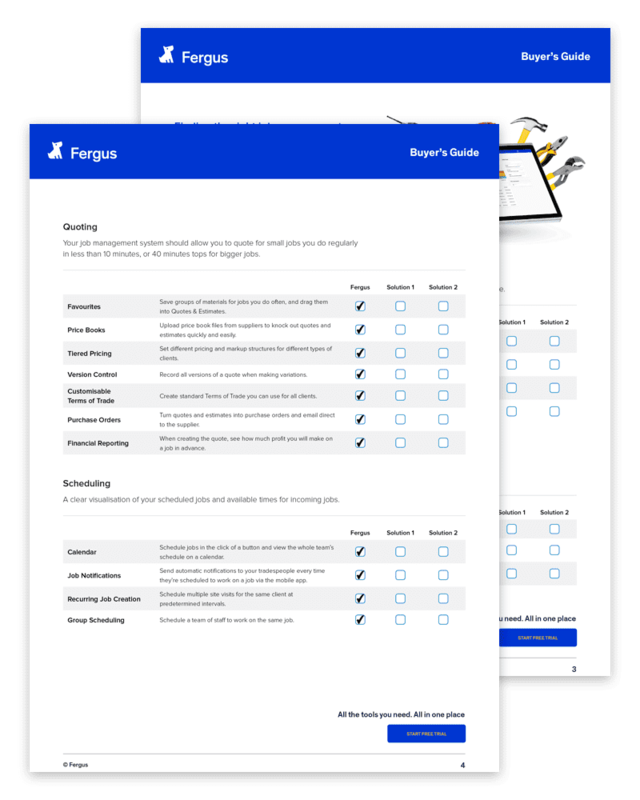 See a list of all the features Fergus has to offer with detailed description of what each one is and how it can help your business. Try Fergus for 30 days. We’ll work with you every step of the way. Use the Job Management Software Buyer's Guide to help you compare features for different job management solutions. Our Buyer's Guide is on it's way to your inbox right now. If you like, get started with a Free Trial and take a test drive too.